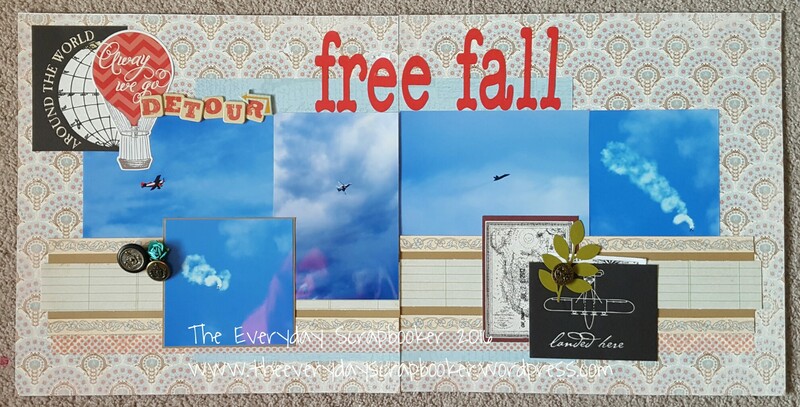 It’s been a looong time since I scrapbooked using Picture My Life cards. 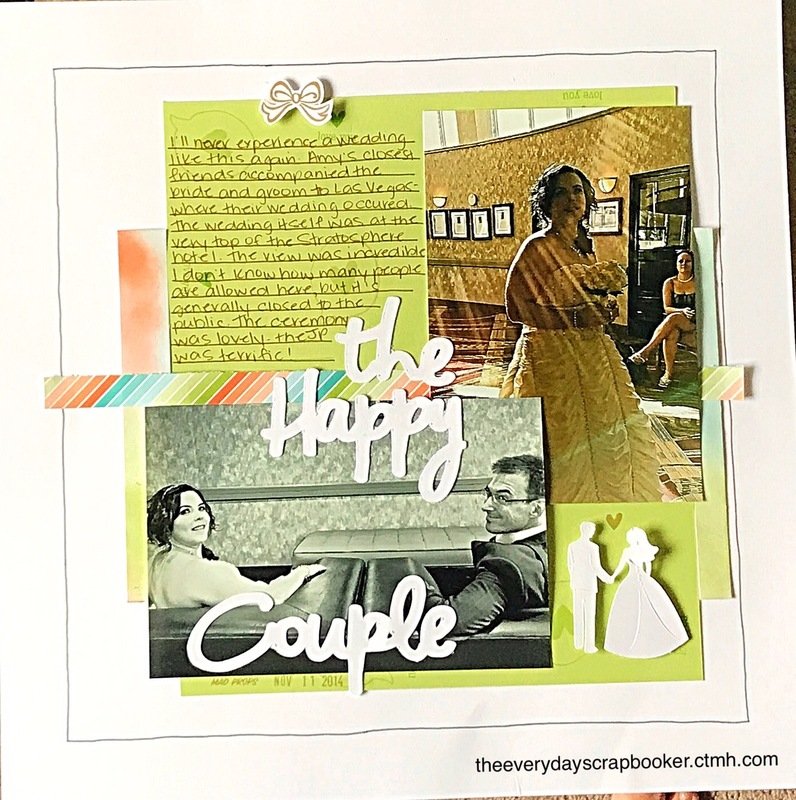 The sketch that inspired this layout also inspired the usage of journaling cards. 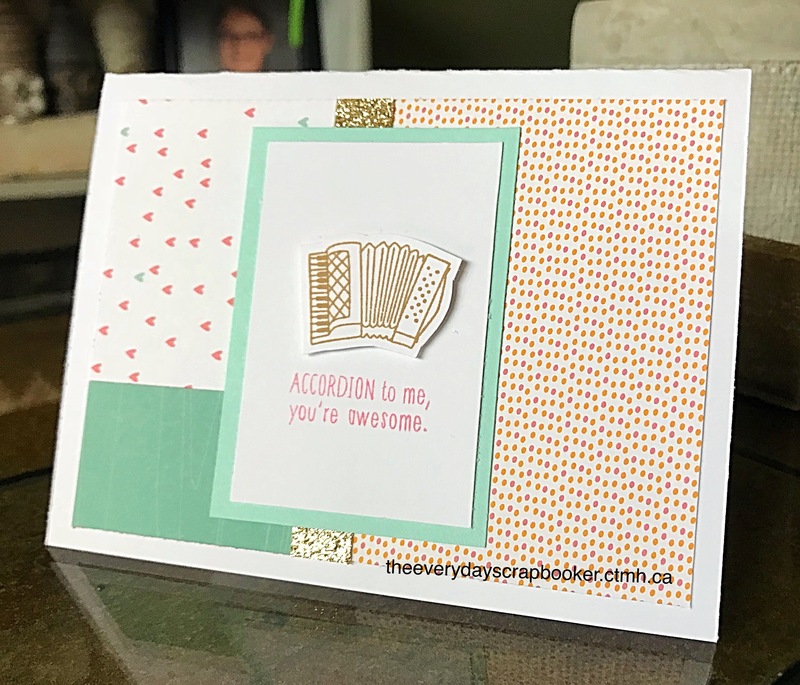 I’m loving that the tones in the one card pairs so perfectly with the Stargazer paper. There’s some Sorbet and Blossom (maybe also Pixie) in there. The Lagoon in the smaller journaling card also coordinates really nicely. I chose to trim it down and layer it on top of the larger one. They both come from (now) retired PML packs. I snapped photos of the twins’ first ever report cards. I’m glad I did, because in years since, report cards no longer come home from their school- we have the privilege of viewing them online and printing them ourselves. It’s not quite the same. I prefer the good old days. They might not be the prettiest pictures to look at, but they’re still a memory worth documenting. Do you still scrapbook your ‘ugly’ pictures? Good morning! TGIF! Another busy weekend is upon us. I’m longing for some peace and quiet. We are finally finished all of our appointments for this month; there’s a few more coming up in November, and then I think things will be relatively ‘quiet’ until the Christmas holidays crowd our schedule again. What are your plans for the weekend? My husband should be up and spending time with me, considering he isn’t working again today (we’re waiting on the repairman to come and fix the fridge), but instead he’s sleeping on the couch. So, I guess I’m going to scrapbook. 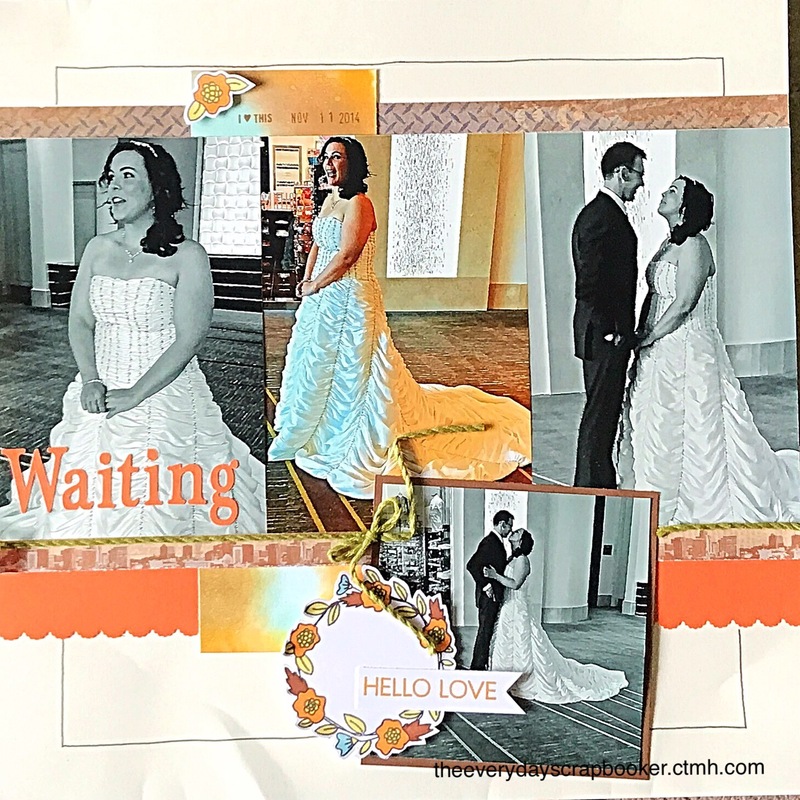 I have a couple layouts to share with you! I’ll share one today, and next time I’ll share the next. I hope you enjoy it! Some of the embellishments here are not from CTMH, but happily the rest is. I’ve had the fortune cookie in my stash forever. I scratched off the fortune portion to reveal its message, and adhered it with some pop dots. Also, the cork hearts are not CTMH. I think the neutral colour contrasts very nicely with the soft background. I’m in love with the colours! Good morning! It’s a wet and dreary morning here in northwestern Canada, which is great because I’m going to scrap today! I’m going through crafty withdrawals. I figure it’s high time I get back to it. As you know, I held a kid friendly scrapbook workshop on Saturday. If you missed my post about it, you can find it right here. I thought it would be nice to make cards for each of my guests thanking them for participating and sharing info about my next planned workshop. Today, I thought I’d share it with you. To create this card, I used one of the patterns from my CTMH Originals Card pattern books (Lucky Three, pg. 59) and used up some more Little Dreamer and Jack patterned papers. I also threw in some CTMH glitter paper that I’d trimmed down for my Christmas cards and a bit of Sea Glass cardstock for the matted image. The stamped image and sentiment cane from an upcoming stamp of the month. Stay tuned for that! Hello friends, this will be a quick post (again) because life is going to interrupt very shortly (again). 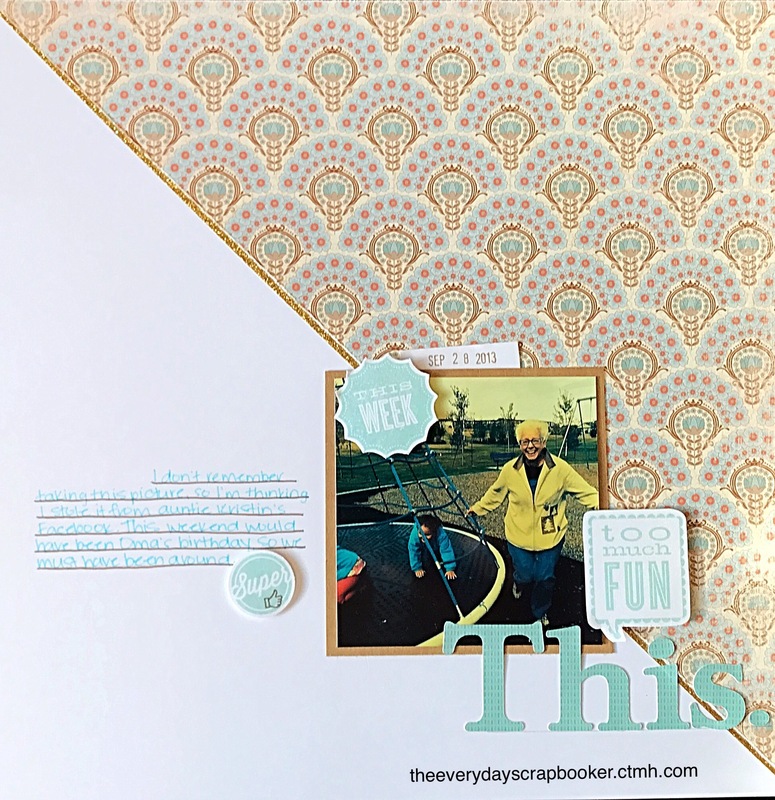 How often do you use journaling cards in your layouts, and why do you use them? Is it quick to create, easy to work with or another reason? Maybe it works best with a particular sketch you found. I used journaling cards here simply for that reason- I figured it would work the best with the sketch I’d chosen as my inspiration. (It cane from Pinterest, by the way). I also created my own journaling card using CTMH stamps and ink. I completed my layout with extra stickers from the Adventure Cut Above Kit I used here. Ever draw a blank as to what to write or say when you sit down in front of your computer to pound out a blog post? I’m there today. So, I’ll make today’s post a ‘wordless’ post, and I’ll just share the rest of my dear friends’ wedding layouts. I really enjoy sharing the products I used to create each layout, but for the sake of space and time, I’ll skip that step today. Happy hump day dear friends! I should just mention here, the layout above was created using a sketch created by a fellow CTMH consultant, Chris Lothian. I found some of her sketches on Pinterest. Find more of her work and sketches on her blog www.christinescreativecapers.blogspot.com.au. I used another one of her sketches on an upcoming layout. Stay tuned for that! This concludes all the wedding layouts, but I have a few more from our trip to Vegas, outside of the wedding! I wish there was more, because was saw soooo much while we were there, but what I’ve got will have to do! Stay tuned, and thanks for joining me today! I like finding different ways to use up my paper stash. I had this leftover sheet of Balloon Ride patterned paper that was cut in half diagonally, and when I found a sketch online that was similar, I ran with it. I don’t think the sketch originally showed the page parted this way, but its how I interpreted it. I worked with what I had, and I quite like the outcome. The filter I used to edit the picture (I don’t know what it is anymore) matched the creamy hues in the Balloon Ride paper, which is why I paired them together. There’s also hints of blue throughout the picture- both my daughters had on blue fleece coats and the merry go round they are riding on is blue. 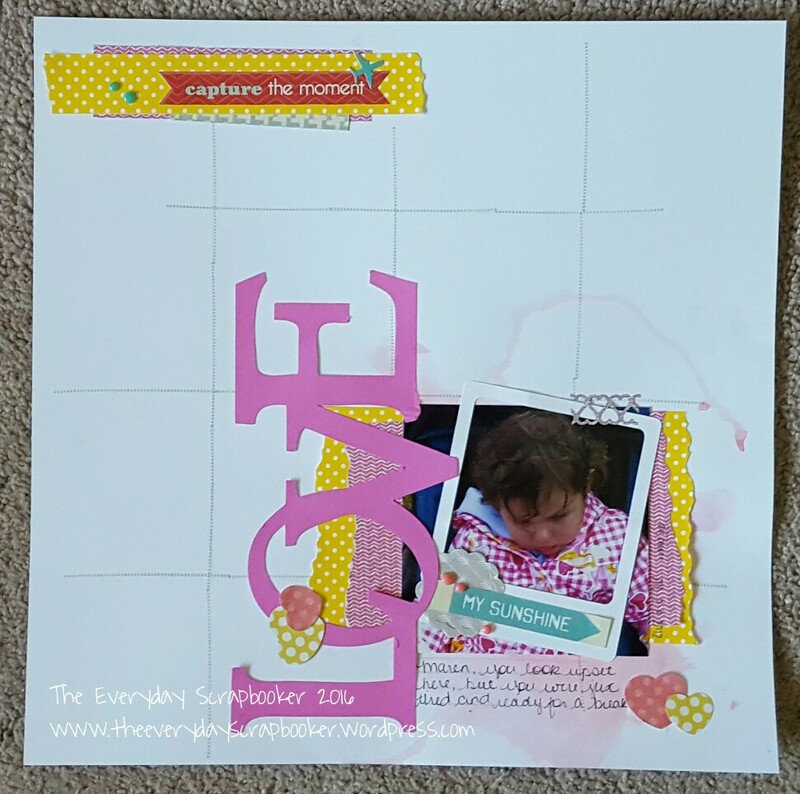 How do you choose the pictures you scrapbook? I hope all my American friends- expats and natives- are enjoying their 4th of July celebrations today! I can’t wait to see all my friends’ and family’s pictures. I’ll be doing celebrating of my own- in my own special way today- I’m sharing more of my artwork with you today! I’m also doing it while the kiddos still sleep, so that in itself is worth celebrating! I made quite a few layouts in between this post and my last post from last week, and I’m not quite sure where to start! Should I share them all, or start with my most current one? My heart is telling me to start with the oldest one, which means I’ll have lots of catching up to do! Is everyone in agreeance? If so, lets get started! One of the fun things about going to visit Grandma M is all the fun things she has planned for the kids to do while we visit. This time, in particular, we were visiting so that my husband could get his hunting fix in; once that’s done, we sit down and make deer sausage from it. It sustains us throughout the year, when we come back again for more! All four of us loves our wild meat. Having children this time around, threw a new kink into our tradition. Somehow we had to keep them entertained while we worked, and this was grandma’s solution. Grandma M to the rescue! The scraps I used came from three different CTMH collections and Fundamentals papers. See how flawlessly collections can work with each other? And, the sizes of papers are just large enough to direct your eye to them without overwhelming the layout. I just love it! Its just enough drama to be noticeable, but not over the top. Something like my twins’ personalities. And, as you can see, I doodled some more on this layout, as well. Doodling makes my heart so happy. Just as a side note, I used my Cricut to cut the title and crown, and the washi tape may (it may also not) be CTMH. I don’t remember anymore! 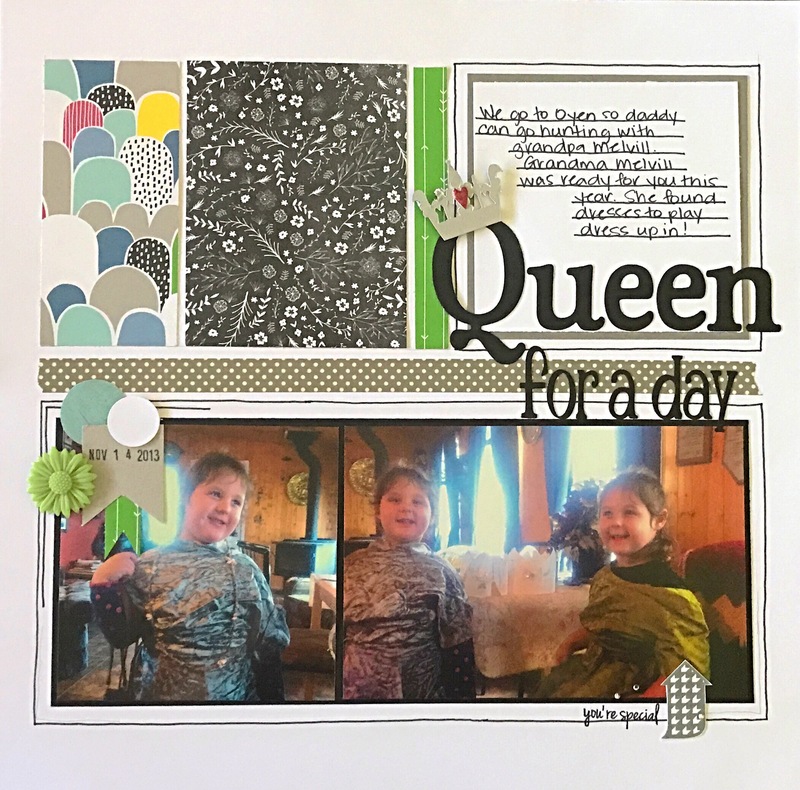 Part of the title was cut using Cricut CTMH Art Philosophy (the word ‘queen’); the rest is Sophisticated and A Child’s Year, neither of which are CTMH products. Hello on this blizzardy and treacherous Friday! The snow seems to have stopped falling for now, but my husband is still out there working, and I’m worried about him! Well…worried about him driving in these poor conditions. No one should be out there, for any reason. This was what my street looked like before I got out there to shovel. 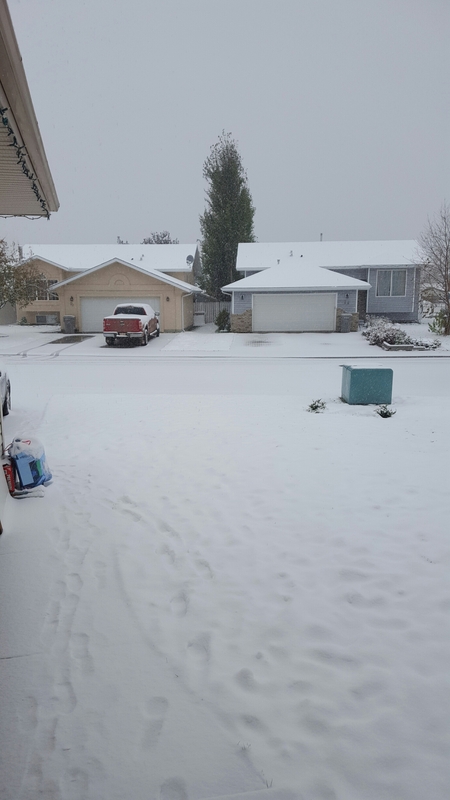 It’s deceiving- it’s wet and heavy snow, and it’s made driving conditions in the north part of the province very tricky! This is my last airshow layout! I was able to snap a few pictures of the airplanes doing their thing during the show. It was impressive to watch! I used a mixture of CTMH and Recollections papers to create my layout, and you’ll notice I even snuck in a bit of washi tape for a cute little border! I haven’t used my washi in quite awhile. It felt good! Lastly, I used a Carta Bella journal card and Echo Park (I think?!) balloon sticker for embellishing the top left corner. I raided my button stash, and added some of my grandma Murray’s old buttons for a small cluster also on the left page. On the right page, I adhered a couple more journal cards, a button and a cricut die cut to complete it. This sketch inspired today’s layout spread. Good morning! Are you enjoying your weekend so far? It’s looking like another day to play inside, unlike the day we spent with Oma in the picture above. Any day spent with our grandparents is a blast! My inspiration came from this sketch over at Let’s Get Sketchy. I cut the file folders with my cricut (two of them), then layered them slightly askew. Next, I added 3×4 inch scraps if paper to the inside of the top file folder, adding my photo ontop lastly. I finished my page with a few other odds die cuts and stickers. Hello friends. It’s a holiday weekend here in Canada- we’re celebrating Thanksgiving on Monday. I’m cooking dinner for my family, my FIL and one of my husbands’ buddy’s. You won’t see me here Sunday or Monday, but I’ll catch up with you again on Tuesday! Since it’s a holiday weekend, it also means my kids get an extra long weekend. Today is a PD day for the teachers. Yay for extra long weekends! I began with this sketch, using a stamp to create the grid in the background. (The ink is CTMH). 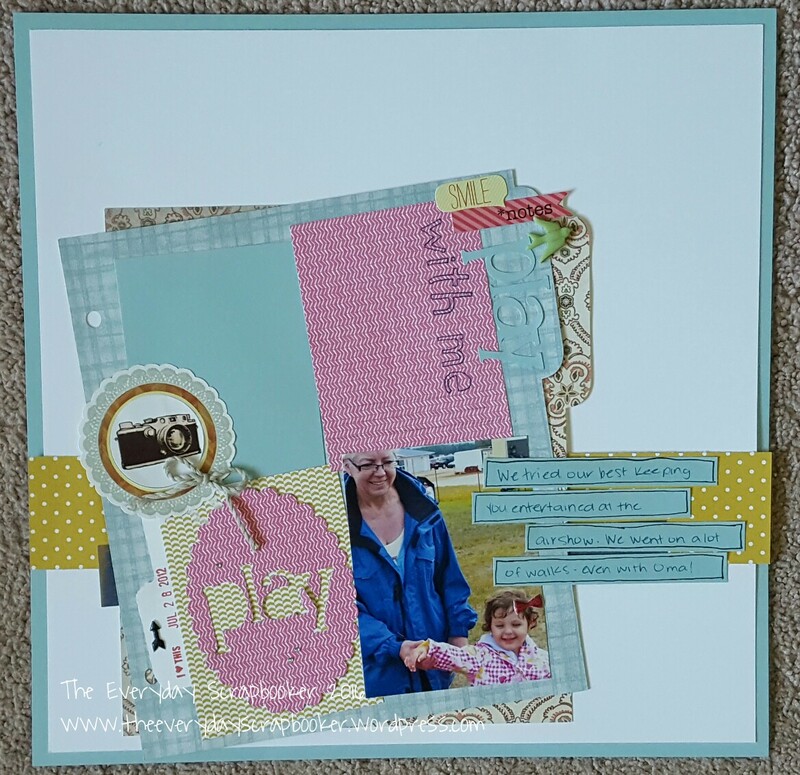 I layered strips of scrap patterned papers to create two focal points- one to mat my photo and the other as an embellishment cluster. 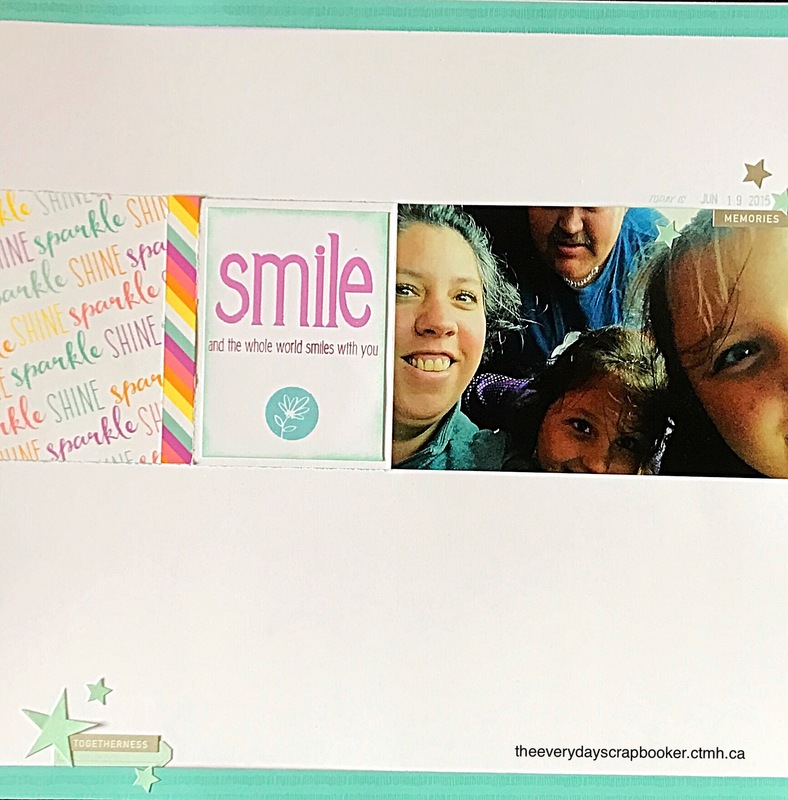 The title was cut with my cricut, and I completed my page using various stickers and ephemera.